This motorcycle is smooth and simple to ride. It is battery operated, Charge the battery according to the included instruction manual- then simply just turn it on, press the pedal, and go. 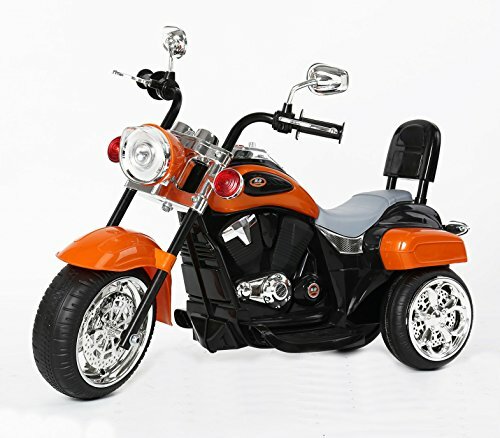 Also comes with realistic details that rider will surely love: sharp colorful and chrome decals, car sound effects, reverse ability, and headlights that turn on and off. Perfect for both outdoor and indoor playing and can easily be used on any hard, flat surface such wood or cement floors. Dimensions: 90 x 48.8 x 63.5 cm, Battery: 6V 4.5Ah, speed: 4.5 KM/h, motor: 18 W, Materials: plastic and carbon steel, adult assembly required.